Unbeaten on the first two days of action in the Women’s event at the Liebherr 2018 World Team Championships in Halmstad, on Tuesday 1st May, Jeon Jihee maintained her outstanding form; more pertinently her efforts maintained Korea’s unblemished record. In the contest between the hitherto unbeaten outfits in Group D; Korea, the no.5 seeds, beat Hong Kong, the no.4 seeds, by three matches to one. Impressively the 25 year old employed her fast attacking skills to good effect to beat both Doo Hoi Kem (7-11, 11-4, 11-7, 11-6) and Lee Ho Ching (11-5, 12-10, 11-6). 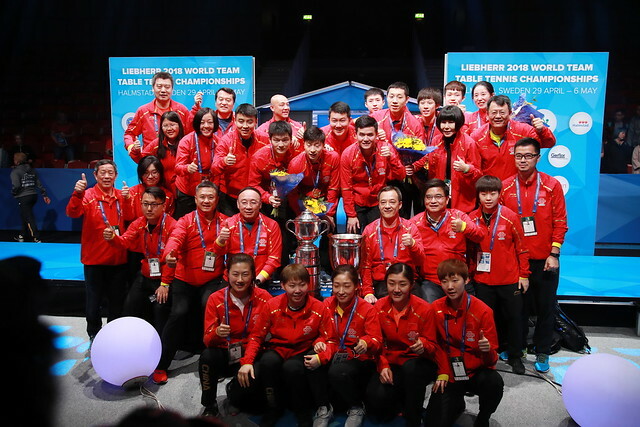 Defeat for Hong Kong but the odds are still in their favour that alongside Korea they will reserve a main draw place. The intriguing situation is the battle for third position and progress to compete for a top 12 place; both Germany and Thailand kept their aspirations alive. Represented by Suthasini Sawettabut, Tamolwan Khekhuan and Orawan Paranang; Thailand recorded a three-one success in opposition to Brazil’s Caroline Kumahara, Bruna Takahashi and Gui Lin. The one win for Brazil was recorded by Bruna Takahashi, in the second match of the fixture she accounted for Tamolwan Khetkhuan (11-9, 9-11, 11-7, 11-6). Impressive from Thailand; it was even more impressive from the German trio of Petrissa Solja, Sabine Winter and Nina Mittelham. They recorded a three-nil win against the Luxembourg outfit comprising Ni Xialian, Sarah de Nutte and Danielle Konsbruck. Undoubtedly the key to the victory was the opening match of the fixture when Petrissa Solja beat Ni Xia Lian (11-6, 11-6, 8-11, 11-9). In the concluding group stage fixtures Korea plays Brazil, Hong Kong opposes Luxembourg but the vital fixture is that between Germany and Thailand; it is the contest that will decide third place and progress to the main draw.